Spaghetti all’amarticiana is by far my favorite pasta of all time. It just doesn’t get any better than pork, tomato, red pepper flakes, garlic, and pecorino cheese. They are just some of the best things on Earth, and they blend together beautifully in this delectable sauce. 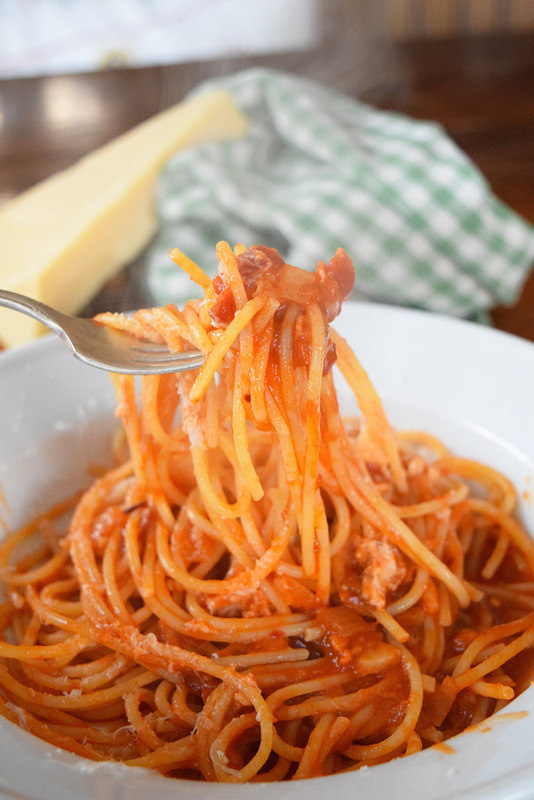 Spaghetti all’amatriciana is super easy to whip up, because it only has a few ingredients and takes under 15 minutes from start to finish. 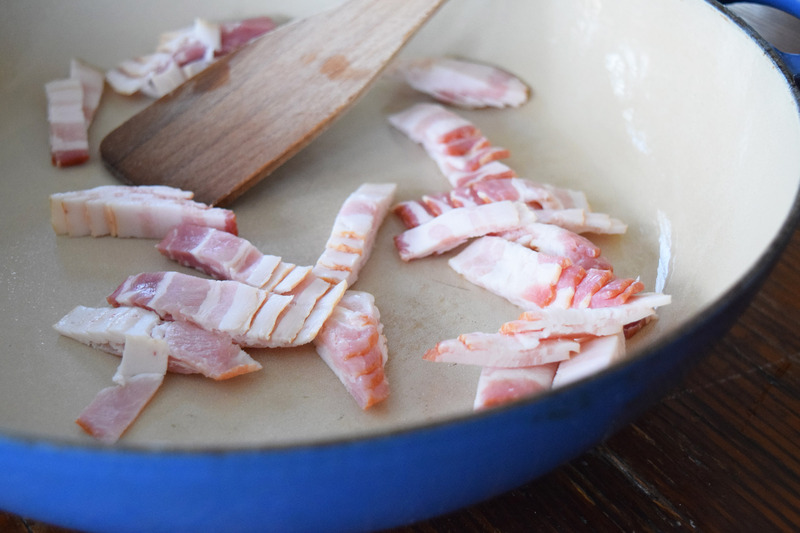 Start by slicing 8 strips of bacon into lardons or chunks and place them in a pan on the stove. 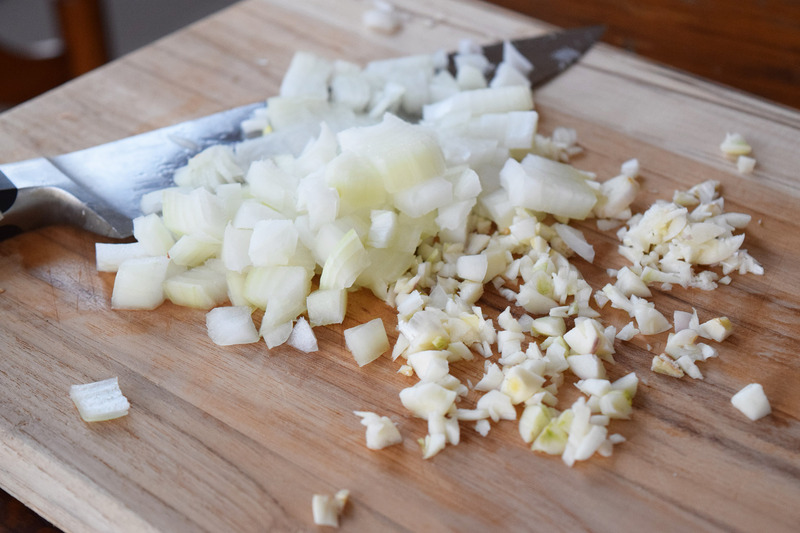 While they are cooking up, chop up an onion and 3-4 cloves of garlic. 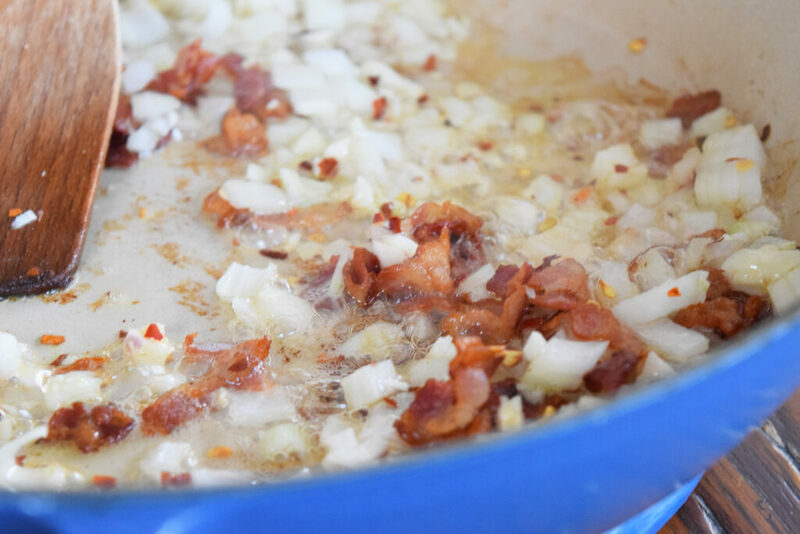 When the bacon is nice and crispy add in the onions and garlic. You could strain off some of the grease, but let’s face it, it just wouldn’t be as good if we played it like that. Toss in the 2 teaspoons of crushed red pepper flakes at this point too, so they will start to release their goodness. Then add the tomatoes. Now, sometimes I use whole, peeled tomatoes, other times I use tomato puree or sauce. You can’t really go wrong, but my favorite kind are the Pomi boxed tomatoes. The boxed San Marzano tomatoes are also amazing. You need to add about 2 cups (16 ounces) of tomato. Let it cook down for about 5-6 minutes to mellow out the tomatoes. Turn it on low for this part. Grate up a bunch of Pecorino Romano cheese. It’s much saltier and sharper than parmesan and really accents this sauce well. 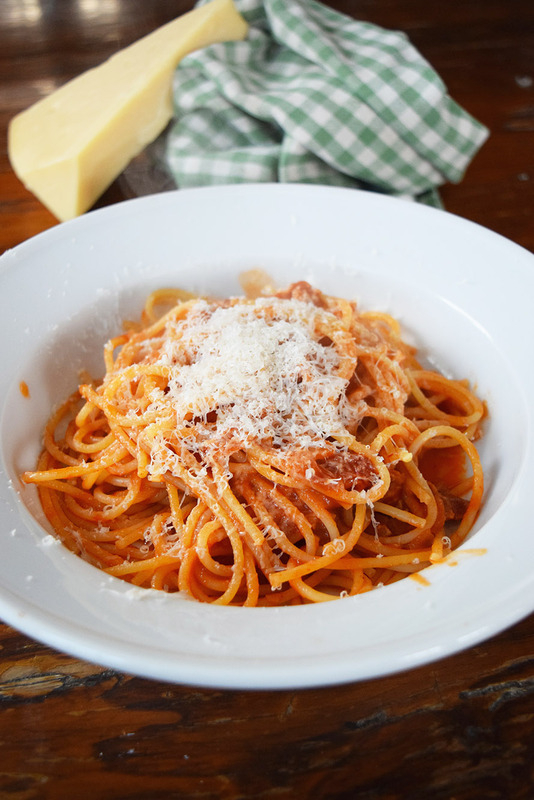 Undercook your pasta by about a minute and dump it into the sauce with a little bit of the pasta water. Stir it and let the pasta get to know the sauce. Serve in the largest bowl you have topped with a mound of the Pecorino cheese. Voila, heaven. Printable is below!! The best pasta you will ever eat. 1.Cook the pasta in boiling salted water. Undercook by about one minute, reserving about 1/2 cup of the pasta water. 2. Cook the bacon in a pan over medium on the stove until slightly crisp. Add in the onions, garlic, and crushed red pepper until onions are soft. 3. 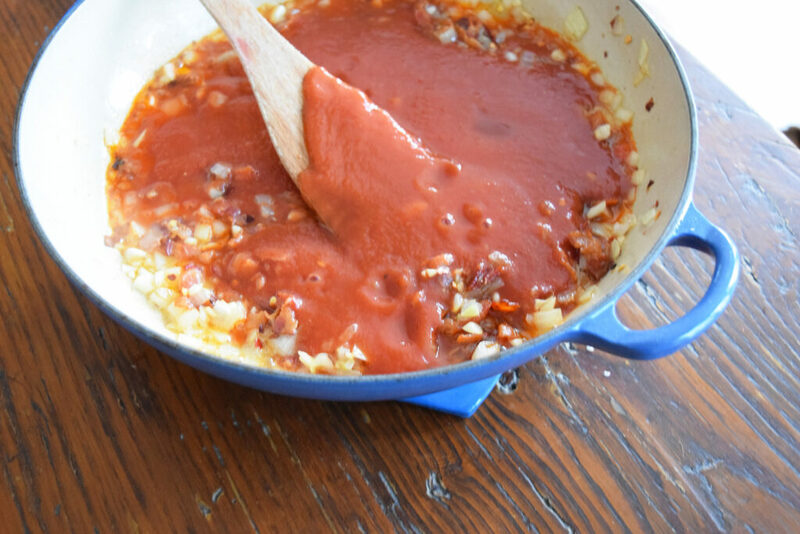 Add the tomatoes into the sauce and cook for about 5-6 minutes. 4. Add pasta and pasta water. Cook for another 1-2 minutes. Top with Pecorino cheese and serve.